Eosinophilic ascites is a rare presentation of eosinophilic gastroenteritis (EGE), a rare condition first described by Kaijser, in 1937; Hundreds of cases have been reported . EGE affects both adults and children. EGE is defined by the presence of gastrointestinal symptoms with an abnormal eosinophilic infiltrate of the intestine wall and exclusion of other causes of secondary eosinophilic infiltration; EGE has 3 clinical presentations depending on the depth of eosinophilic infiltration of the bowel wall [1-4]. The mucosal form (44% of EGE cases ) is associated with diarrhoea, malabsorption, protein-losing enteropathy or bleeding. The muscular form (12% of cases ) corresponds to eosinophilic infiltration of the muscular layer and may result in acute obstruction. The serosal form (39% of EGE cases ) may result in eosinophilic ascites (21%). Here, we report a rare and challenging case of eosinophilic ascites. 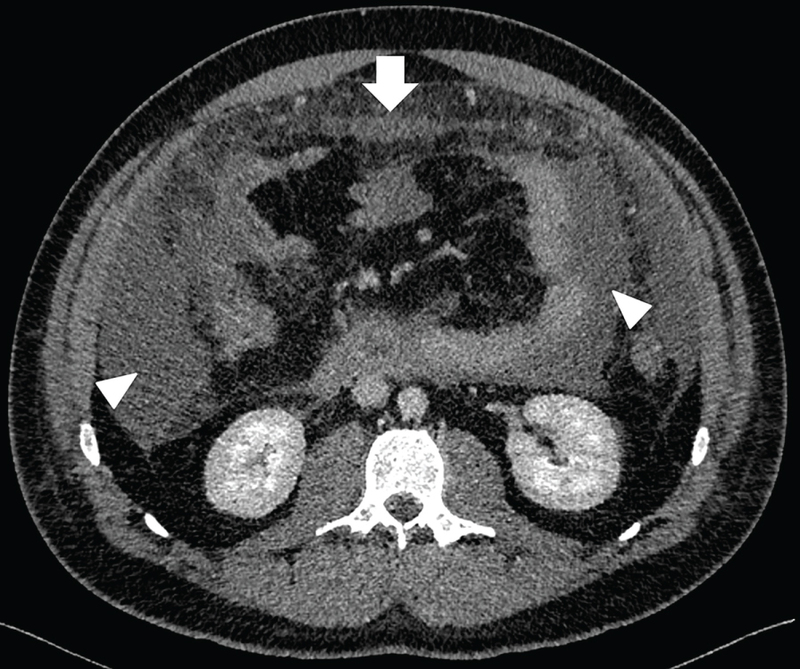 A 25-year-old man presented diffuse abdominal pain, vomiting and left chest pain since a week. He had a history of asthma in childhood. He gained 9 kg within a few weeks but reported no fever or diarrhoea. Physical examination showed abdominal distension due to ascites and reduced vesicular murmur with dullness in the base of the left chest. Laboratory testing revealed a moderate hypereosinophilia, 1.1 × 109/L, and elevated C-reactive protein level, 160 mg/L. Liver function and lipase dosage were normal. Chest radiography revealed moderate left pleural effusion. CT scan of the abdomen (Figure 1) demonstrated a large amount of ascites and a thickened omentum, with normal liver. MR enterography showed a normal small bowel and colon as well as ascites and a thickened omentum. Ascitic fluid analysis revealed an exudate (protein level 50 g/L) and inflammatory cells, predominantly eosinophils, and no malignant cell (Figure 2). Smears were negative for acid-fast bacilli and culture was sterile. Upper gastrointestinal endoscopy revealed severe oesophagitis and bile reflux. Serial biopsies showed no eosinophilic infiltrate. 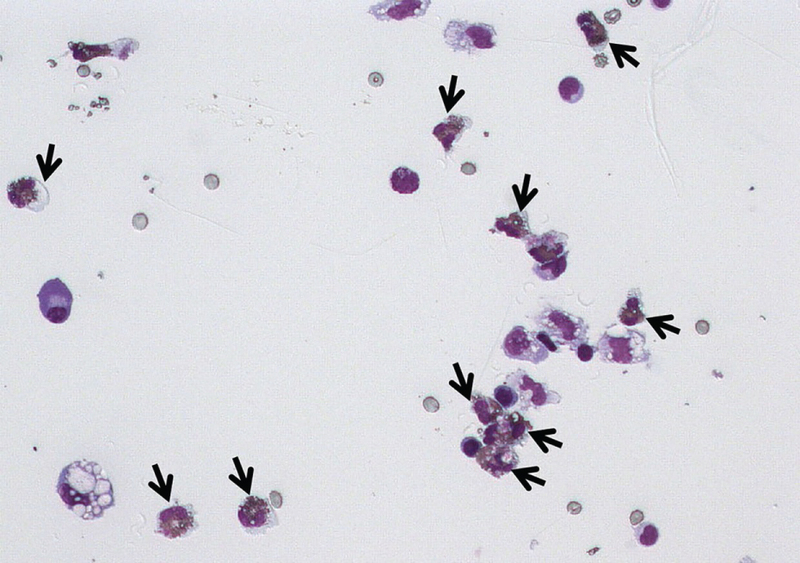 Thoracentesis showed an exudate (protein level 40 g/l) and abundant inflammatory cells, predominantly eosinophils. Smears were negative for acid-fast bacilli and culture was sterile. Echocardiography results were normal. Testing was negative for antineutrophil cytoplasmic antibodies and transglutaminase antibody. Immunoglobulin E level was moderately elevated. Stool samples were negative for parasites. HIV serology was negative. Biopsy of the omentum was performed under ultrasound guidance and revealed an intense eosinophilic infiltrate (Figure 3). These findings were consistent with the diagnosis of serosal EGE with eosinophilic ascites. Treatment with methylprednisolone 120 mg/day was initiated for 3 days and resulted in marked relief with the disappearance of ascites. Prednisone 60 mg/day was progressively tapered and stopped 2 months later without relapse since 3 years. Our patient had the serosal form of EGE with eosinophilic ascites because of peripheral blood eosinophilia, an eosinophilic infiltrate of the omentum, exclusion of alternative diagnoses and excellent response to steroid treatment. He showed no evidence of mucosal or muscular eosinophilic infiltrate. The oesophagitis was related to bile reflux due to abdominal hyperpression with ascites. Eosinophilia was reported in 74 to 78% of EGE cases [4,5]. Our patient had mild peripheral blood eosinophilia as compared with reported eosinophilic ascites cases [1,6]. Upper endoscopy may show a nonspecific gastroduodenal and jejunal inflammation, ulceration or normal appearance . Endoscopic biopsies show eosinophil-rich inflammation but may be negative in up to 13% of cases due to patchy disease  or a serosal form. Pathologic eosinophilic infiltrate was found in 30%, 38%, 62%, 72% and 88% of cases in esophagus, stomach, duodenum, ileum, and colon, respectively; Patients had at least 2 intestinal segments affected in 70% of cases . Other serous membranes could be involved: Pleural effusion and pericarditis were reported in 14% and 5% of EGE cases, respectively . The differential diagnoses includes parasitic infections, tuberculosis, Churg-Strauss vasculitis, malignancy, lymphoma and hypereosinophilic syndrome , which were ruled out in our case. 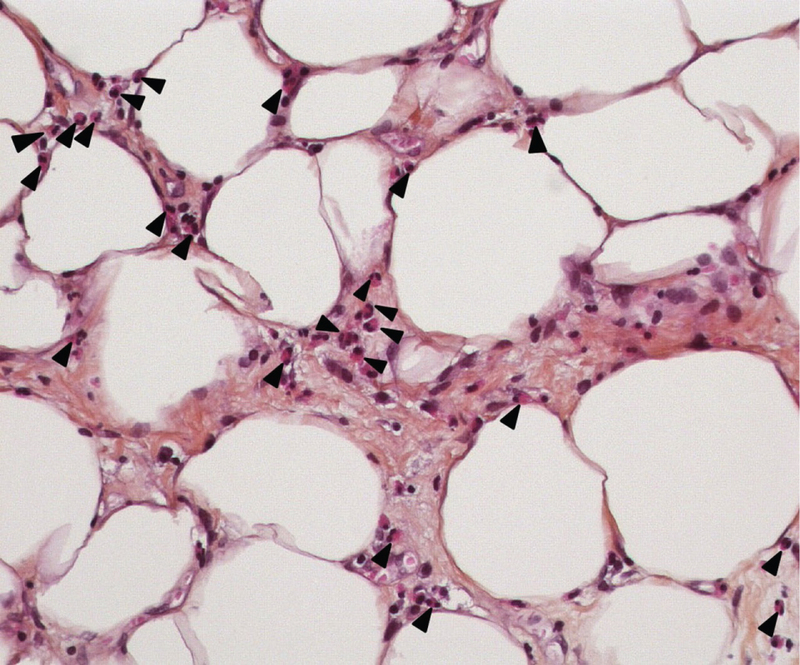 Mild peripheral-blood eosinophilia and no extraintestinal lesions excluded hypereosinophilic syndrome. The pathophysiology of EGE is unclear, but a history of atopy (asthma, eczema, allergic rhinitis) was reported in 44% to 80% of patients with EGE [4,9,10] as in our case; A family history of atopic disorder was found in 16 to 28% of cases [4,11]. Food allergens might trigger eosinophil recruitment and activation in the gut wall [1,9]. EGE is diagnosed with eosinophilic infiltration of the gut wall and/or serous membrane, with lack of extraintestinal disease and exclusion of other causes of eosinophilia. The mainstay treatment of EGE was corticotherapy, given at the dose of 40-60 mg/day for a brief duration (1 week to 4 months) . The prognosis of EGE is usually good; remission is reached spontaneously in 40% of cases and with steroid treatment in 95% of cases . Relapse was reported in 33% of EGE cases . Allergenic food should be excluded when identified. Steroid-sparing molecules have been proposed such as sodium cromoglycate for its mast cell-stabilizing properties, leukotriene receptor antagonist such as montelukast, antihistamines and monoclonal antibodies directed against IgE (omalizumab) and interleukin 5 (mepolizumab), with various results [1,8,12]. Eosinophilic ascites remains a rare presentation of EGE, but the diagnosis procedure, based on pathology and the exclusion of other causes of eosinophilia, is important since steroids are highly effective. Ingle SB, Hinge Ingle CR (2013) Eosinophilic gastroenteritis: An unusual type of gastroenteritis. World J Gastroenterol 19: 5061-5066. Klein NC, Hargrove RL, Sleisenger MH, Jeffries GH (1970) Eosinophilic gastroenteritis. Medicine (Baltimore) 49: 299-319. Talley NJ, Shorter RG, Phillips SF, Zinsmeister AR (1990) Eosinophilic gastroenteritis: A clinicopathological study of patients with disease of the mucosa, muscle layer, and subserosal tissues. Gut 31: 54-58. Pineton de Chambrun G, Gonzalez F, Canva JY, Gonzalez S, Houssin L, et al. (2011) Natural history of eosinophilic gastroenteritis. Clin Gastroenterol Hepatol 9: 950-956. Elliott JA, McCormack O, Tchrakian N, Conlon N, Ryan CE, et al. (2014) Eosinophilic ascites with marked peripheral eosinophilia: A diagnostic challenge. Eur J Gastroenterol Hepatol 26: 478-484. Cuko L, Bilaj F, Bega B, Barbullushi A, Resuli B (2014) Eosinophilic ascites, as a rare presentation of eosinophilic gastroenteritis. Hippokratia 18: 275-277. Durieu I, Nove-Josserand R, Cathebras P, Durand DV, Rousset H, et al. (1992) Eosinophilic ascites. 2 new case reports. Rev Med Interne 13: 446-448. Lemale J, Dainese L, Tounian P (2015) Eosinophilic gastroenteritis and colitis in pediatric patients: Increasingly frequent diseases. Arch Pediatr 22: 769-777. Alfadda AA, Storr MA, Shaffer EA (2011) Eosinophilic colitis: An update on pathophysiology and treatment. Br Med Bull 100: 59-72. Ingle SB, Patle YG, Murdeshwar HG, Pujari GP (2011) A case of early eosinophilic gastroenteritis with dramatic response to steroids. J Crohns Colitis 5: 71-72. Hepburn IS, Sridhar S, Schade RR (2010) Eosinophilic ascites, an unusual presentation of eosinophilic gastroenteritis: A case report and review. World J Gastrointest Pathophysiol 1: 166-170. Foroughi S, Foster B, Kim N, Bernardino LB, Scott LM, et al. 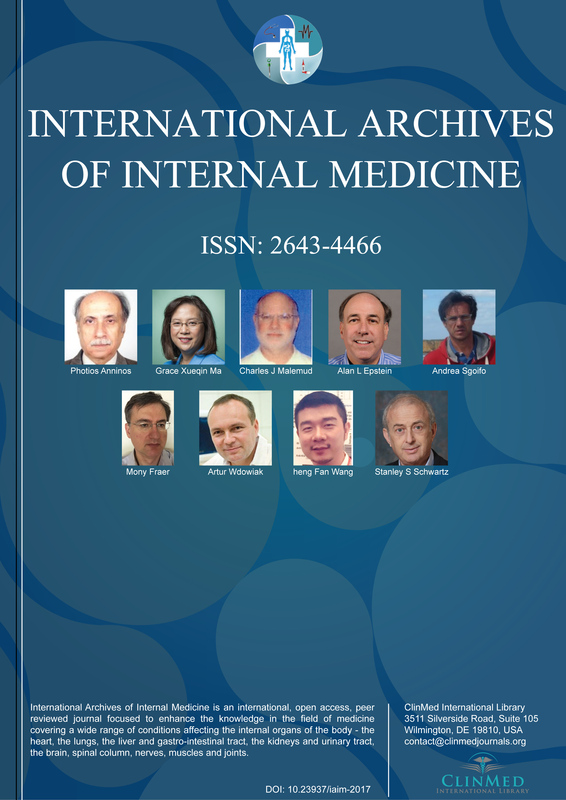 (2007) Anti-IgE treatment of eosinophil-associated gastrointestinal disorders. J Allergy Clin Immunol 120: 594-601. Sara Melboucy-Belkhir, Department of Internal Medicine, Centre Hospitalier de Saint-Quentin, 1 Avenue Michel de l'Hospital, 02321, Saint-Quentin, France, Fax: 003323067044. © 2018 Melboucy-Belkhir S, et al. This is an open-access article distributed under the terms of the Creative Commons Attribution License, which permits unrestricted use, distribution, and reproduction in any medium, provided the original author and source are credited.